What should I do on my 'rest' days? What should I do on my rest days? The word ‘rest’ can be roughly translated to mean 'going about your normal daily routine without needing to do any of the symbol or other practices described in the ebook'. For example, the word ‘rest’ may mean that you continue on with your normal daily routine which might include a morning meditation session / healing work, daily chores and daily work schedule, various food preparations, other life activities that may arise during the day and an evening meditation / healing session before bed. The word 'rest' in this context does not mean that you must lie in bed and ‘rest' at all times (unless of course you really want to). Overall then, we can see here that the word ‘rest’ is more of a ‘please take rest from the previous symbol practices'. These periods of ‘rest’ will be allowing for the necessary energetic changes to take place and will be helping you to ascend, release or heal / purify a deeper layer of impurity or imperfection. Also, during these resting times, it is quite possible that you may experience healing crises as another layer of old or stagnant energies are safely released from within. Above all, we lovingly suggest that you listen to your own body during these 'resting' times and treat yourself gently and with loving kindness wherever possible. In some cases, the Guides / Ascended Beings have explained that the resting periods are even more important than the symbol practices and as we understand it, this is because the energies from the symbol practices are still moving and clearing away impurities so that you can be assisted towards more ascension and vibration uplift for your journey forwards. - What do you mean by 'energy'? - How does energy based healing work? 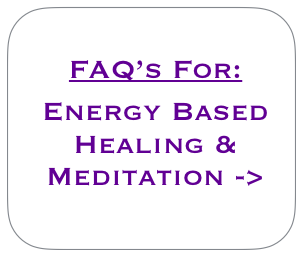 - How long does energy based healing take to work? - What do you mean by 'healing'? - How can I improve my practice? - What should I do on my rest days? - What kind of things can I feel from my practice? - What are my options here for energy based healing?